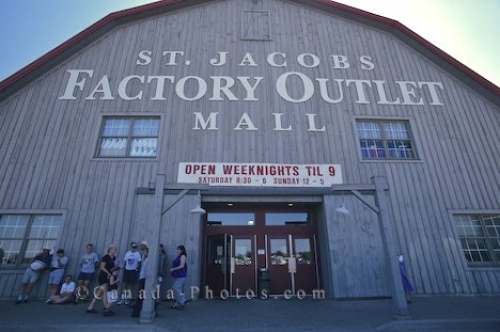 If you are looking for great shopping bargains, head to the St. Jacobs Factory Outlet Mall in Ontario, Canada for some incredible deals. A two storey Factory Outlet Mall in St. Jacobs, Ontario is where your dollar goes a lot farther and you can buy brand name clothes for cheap. Levi, Reebok, Liz Claiborne, Royal Doulton are just a few of the names that are sold in the Factory Outlet Mall only the prices are slashed and people usually check out the price tags twice to be sure they saw the correct price. Factory outlet mall, St. Jacobs, Ontario, Canada, North America. Picture of the Factory Outlet Mall in St. Jacobs in Ontario, Canada where prices are hard to beat.